A tier-1 automotive supplier needed custom workholding fixtures that could hold as many automotive steering components in a machine tool’s designated work area to maximize efficiency and reduce machine count. The machine tool and fixtures would need to be run by a single human operator safely and efficiently. The supplier needed workholding fixtures, but they also wanted to partner with a provider of innovative workholding solutions. They sought a company that could offer the right products as well as the right answers, propelled by fresh ideas from workholding specialists. Ahaus Tool and Engineering was brought in to design and build the workholding fixtures. Working directly with their client, Ahaus’ team of engineers came up with a solution to maximize efficiency and reduce machine count: incorporate the pallet features into the bottom of the fixture, thereby allowing more area for customer parts. Machine tools usually come with a pallet meant specifically as a location to which the workholding device can be affixed. For this project, the pallet was taken off the machine design and incorporated into Ahaus’ design of the workholding fixture. The base of the fixture is also the pallet of the machine. In similar fixture designs, a pallet can be 3–4″ thick. Add that to the measurements of the fixture’s base, another 1–2″, summing 4–6″ of inefficient space. 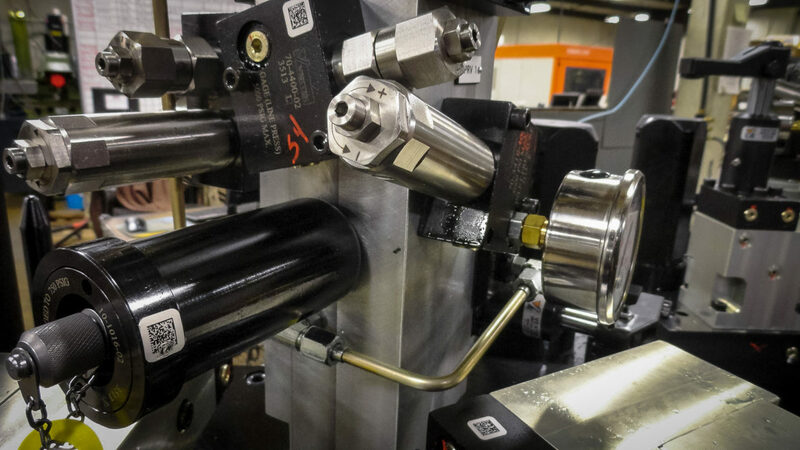 By designing a solution that integrates the pallet right onto the base of the fixture, Ahaus’ engineers were able to double the amount of workholding space available, significantly increasing the machine’s productivity level. Each machine features two workholding fixtures. When one fixture is in the machine being processed, the machine operator unloads the completed parts from the other fixture and reloads it with new parts. In order for the machine to position and secure the fixture, locating cones and pull-down studs, features normally integrated into a machine’s pallet, are here included in the base of the fixture itself. After each cycle, the machine tool has a mechanism that lifts the fixture, rotates it 180°, and sets it in front of the operator for the next cycle. Ahaus worked with the customer to determine the best materials to use for the fixture and the weight restrictions of the design; the base and column of the fixture are made from aircraft-quality aluminum to meet weight requirements.